I don’t want to jinx it, but I feel like Summer has *finally* arrived here in the UK. Last week we welcomed the first May bank holiday with open arms as temperatures reached 25 degrees. 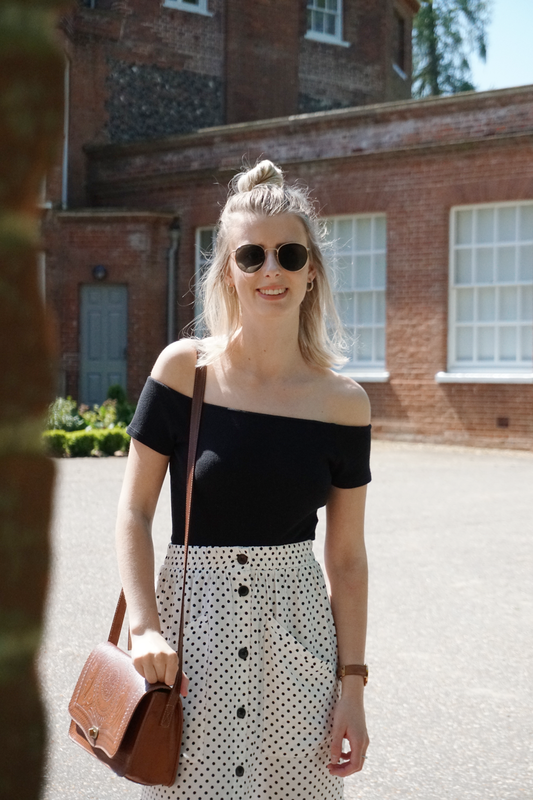 With that being said, I feel like it’s time to get my Summer wardrobe ready, starting off with this beaut little skirt number from Pull and Bear and Sandals from ASOS. First up, in any summer wardrobe you need some tops. I’m talking bardot, camis, bodysuits, crops, the lot. I live in jumpers in the winter so it’s nice to have a bit of variety when the sun comes out to play! Next? The bottoms. I’m all for flowy, light materials when it comes to summer. This skirt from Pull and Bear has to be my favourite purchase of the season, it’s so cool, cute and SO easy to wear! And finally the shoes and accessories. I absolutely adore these sandals and their flatform style, but I gotta be honest with you here guys, I twisted my ankle twice in these bad boys. Maybe stick to these when minimal walking is needed in the future. (shoutout to my boyf for being my own personal crutch). What are your favourite pieces for a summer wardrobe?